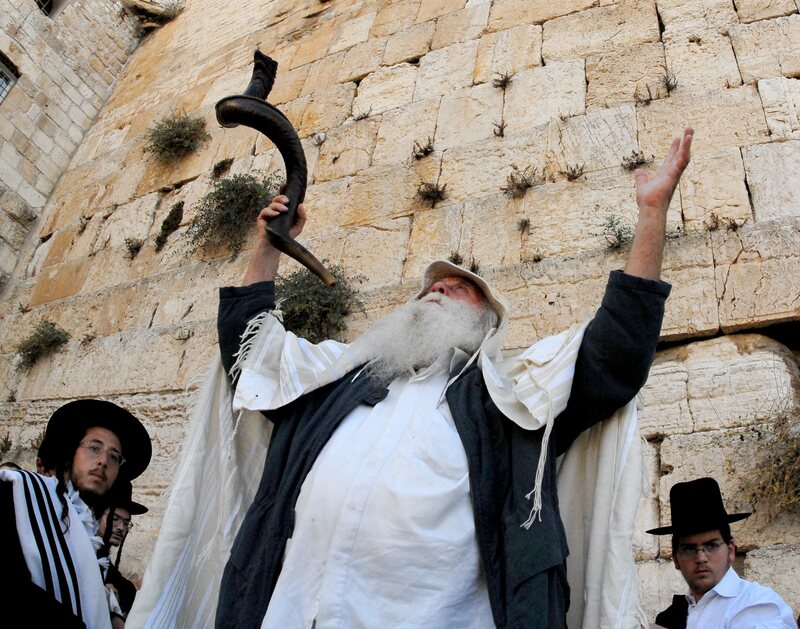 “Slichot” prayer service during the Days of Repentance preceding Yom Kippur at the Western Wall in Jerusalem’s Old City. GPO photo by Mark Neyman. This file is licensed under the Creative Commons Attribution-Share Alike 3.0 Unported license. In our last lesson, we discussed the different theories on the rapture of the church following the breaking of the sixth seal. When the seventh seal is broken by Jesus, there is silence in Heaven for half an hour. The Great Tribulation begins around this point—after the antichrist breaks the covenant, commits the abomination of desolation and after the sixth seal. The period is the second half of Daniel’s 70th week, although it doesn’t last a full 3 ½ years because God intervenes. Sequential- The judgments happen consecutively Seals – Trumpets – Bowls just like their order in Revelation. Telescopic – The first six seals lead to the rapture then the Trumpets and Bowls take place. The seventh seal, seventh bowl and seventh trumpet happen together (read the descriptions of each), all ending with Jesus’ arrival. The First Trumpet: Hail and Fire, mixed with blood. Burns up 1/3 of the trees and all of the grass. Many people die. The Second Trumpet: A great mountain burning with fire (volcano?) is thrown into the sea. The water turns to blood and 1/3 of all sea life dies. 1/3 of all ships are destroyed. The Third Trumpet: A star named Wormwood falls to earth, poisoning 1/3 of the water. The Fourth Trumpet: 1/3 of the sun is struck, 1/3 of the moon and 1/3 of the stars. The earth now gets 1/3 of its regular light as a result. The KJV translation substitutes angel for eagle in this verse. In Hebrew, the word is nesher. In other parts of scripture, this is used to describe a vulture. Jesus also uses this word for a vulture in Luke 17:37. How does the meaning change depending on whether the creature is an angel, an eagle or a vulture? What do you think of when you imagine them? For the angel, look back at the image of the four seraphim in the throne room. The Fifth Trumpet: A star falls to earth. The star is an angel and he opens the abyss, unleashing locusts (demons) who can sting and bite people who are not sealed for five months. They are led by the king of the bottomless pit: Abaddon or Apollyon. Like Hades, this signifies both a place and person in scripture. Read the full description aloud (Revelation 9:1-12). The Sixth Trumpet: The sixth trumpet blows and four angels bound at the river Euphrates are unleashed with a demonic army of 200 million soldiers to kill 1/3 of mankind. Read Revelation 10. This is a strange story, even for Revelation, where an angel holding a tiny scroll spoke like seven thunders. John was commanded to eat the scroll rather than write down what he was told at that time. In this chapter, we learn that there is to be no more delay. The Seventh Trumpet: The final trumpet sounds and the same events that appear at the seventh seal take place. See the overlap? The trumpet judgments (especially the first four) are very similar to the plagues of Egypt in Exodus. (Exodus 9:13-35, Exodus 7:20-21, Exodus 10:21-23). However, there is a message to all of the first six trumpets: REPENT! Consider this analogy of the Jewish calendar. Thirty days prior to Rosh Hashanah, the shofar (trumpet) is blown at intervals to remind people that it is time to repent and rid their lives of sin because the day of judgment is coming. At Sundown 163 days after Passover (this year Sept. 15), the shofar is blown signifying time is up and the holiday begins. Rosh Hashanah begins on the first day of the month of Tishri (usually begins in September) however it is tied to Jesus’ quote that no man knows the day or the hour. Even though it was supposed to begin, no one was allowed to celebrate the holiday until the Sanhedrin made an official announcement. Thus, no one knew when they would do it. Today, Rosh Hashanah is the only two day holiday. The ten days between Rosh Hashanah and Yom Kippur are the Days of Awe, where you are supposed to rid your life of blame, repent, make amends and turn from evil. In Jewish custom, it is believed that God opens the Book of Life on Rosh Hashanah and people have 10 days to improve their fate before the verdict is sealed on Yom Kippur. Do you see the analogy? How might the seven trumpets signify the arrival of Rosh Hashanah and the impending judgment of mankind? How might the time of the tribulation be seen as the Days of Awe leading up to the declaration that the delay is over? Revelation is a book of symbols. We have discussed several and will discuss several more. In the judgements following the trumpets, many of the results involved the fraction 1/3. Read Ezekiel 5. Do you see any similarities in the number now as it relates to Jerusalem?